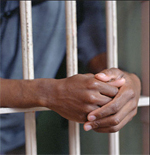 The Justice Policy Institute has a new report "The Vortex: The Concentrated Racial Impact of Drug Imprisonment and the Characteristics of Punitive Counties," on the racial disparity in the imprisonment of drug offenders. 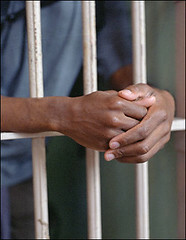 The report confirms that African Americans are imprisoned in far greater numbers than whites. Of 175,000 people sent to prison for drugs nationwide in 2002, over half were black, though blacks are 13 percent of the population. It found no relationship between rates at which people are sent to prison for drug offenses and the rates at which people use drugs. The study said 9.2 percent of blacks use illegal drugs, compared with 8.1 percent of whites. The Supreme Court will hear oral arguments today in two drug cases, Gall v. United States and Kimbrough v. United States. The Kimbrough case will bring the disparate penalties for crack and powder into full focus. U.S. News today has some numbers on the sentencing disparity. The Gall case will define the circumstances under which a judge can sentence below strict federal sentencing guidelines. In a nutshell, Gall's guidelines were 30 to 37 months for minor participation of limited duration in an ecstasy conspiracy. The Judge deviated from the Guidelines to a sentence of probation, the Government appealed and the 6th Circuit reversed the trial court.